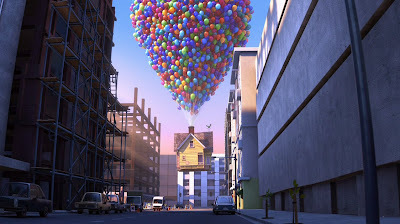 Last night I had the pleasure of watching 'UP', Pixar's 10th animated film. Being a HUGE Pixar fan, I couldn't wait to see the newest cinematic treat, in 3-D nonetheless. 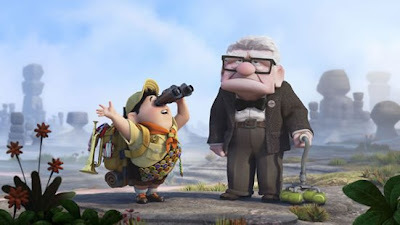 I had to blog about it since I feel it is truly the best Pixar film to date. Besides it's fantastic can't believe your eyes digital animation, the story-line really cinched it for me. The film combines a bittersweet coming of age story with unexpected friendships and surprising adventures along the way. The movie plot was completely original and seemed light-hearted enough for kids, but also somewhat dark with many adult themes (aging, loss, separation and unfinished promises). There is a very memorable montage towards the beginning that is so poignant, I literally started to well up. There are many very funny moments but overall, this picture really stands on its own and is hard to compare to its Pixar predecessors. Go see it!